For aspiring artist Amanda Walsh, who only half-jokingly goes by the nickname Zero, the summer before college was supposed to be fun—plain and simple. Hanging out with her best friend Jenn, going to clubs, painting, and counting down the days until her escape. But when must-have scholarship money doesn’t materialize, and she has a falling out with Jenn that can only be described as majorly awkward, and Zero’s parents relationship goes from tense to relentless fighting, her prospects start looking as bleak and surreal as a painting by her idol Salvador Dali. Will life truly imitate art? 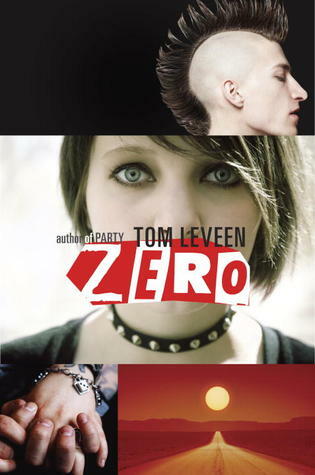 Will her new, unexpected relationship with a punk skater boy who seems too good to be real and support from the unlikeliest of sources show Zero that she’s so much more than a name. This book was a very good read! Set in Phoenix, Arizona the summer after Amanda Walsh’s graduation. Amanda, also known as Zero, had her eyes set on going to the School of the Art Institute in Chicago (SAIC) in the fall and having the best summer of her life before then. Zero ends up not having the money for SAIC, her parents are constantly in an argument, and she’s not speaking to her best friend. After a night at the club watching Gothic Rainbow, she meets Mike. The drummer for Gothic Rainbow. They start dating and he gets her thinking about her future. The story is about first loves, best friends, family….. I loved that this book is a book that some can relate to. Maybe not the art aspect, but being young again.